Right before I went to the west part of Germany, then Luxembourg, Strasbourg (France), Trier (Oldest city in Germany) and finally Berlin for my birthday and new year’s eve, I had this crazy week. . . If you have a Couchsurfing account in a popular holiday city, you get dozens of requests a month. If you happen to have a few references you get a dozen per week. I decided to host as many as I could fit in my schedule, already loaded with last minute papers, presentations and a new job. I ended up meeting 4 people. Dave, Brena, Helen and Laura. Boryeon, a traveller from South Korea arrived in Munich on a crazy week. I hosted her and another surfer named Helen, from Turkey, who joined us the next day. Boryeon was from South Korea, finishing her trip across Europe and a little more than a week away from heading home. We walked around, talked a lot, had food and our cultural differences were astounding. It was very nice to have a different dynamic based on our limited ability to communicate. But very quickly we developed a way to make things happen and exchanged complicity. Days later she was gone. She put up with my busy schedule, was autonomous, and every time I was free or willing to do something, made sure I was over with my homework before she said yes. We had an awesome time, and walked around the city with Helen as well, bierhall etc. Their eyes widening over the Marienplatz Christkindlmarkt were a beautiful thing to witness. Laura sent me a request quite in advance and very personalized, I had to say yes after reading her profile and her message, I had a few things to confirm before seeing as I made plans for that same weekend but it was more than likely for them to get cancelled. 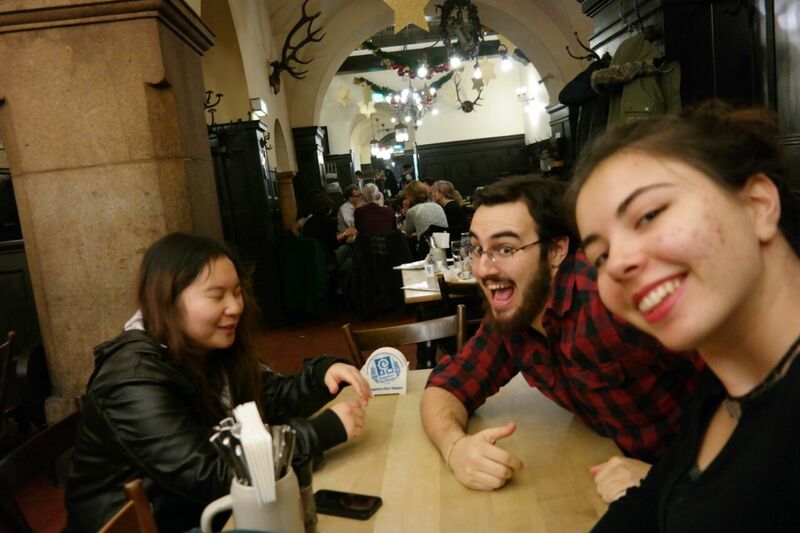 We met where I live in Munich; Studentenstadt, and started talking a bit. Quickly over the first few awkward moments, we started to explore the city together. I was supposed to spend just a bit of time with her but we ended up doing most exploring together. Drinking Glüwein in Christmas markets, doing my multiple errands, eating my friend’s Ole’s cake, having Tea, going out for drinks with my Bavarian friends and ending up in a giant club, back home at 5 in the morning and just getting lost around town. When she left, she put my keys in the mailbox, left a little note with some tea boxes and a coin from Algeria, hinting to us meeting again. Usually have a great time with people from Couchsurfing. . . A good thing that it is said we always meet twice in life. A few days later, I was finishing papers, presentations and headed to Saarland for Christmas. I used Couchsurfing again when I needed to spend the night in Strasbourg, France, as my lift to Berlin was only leaving the next day. I was hosted by Maïté, a generous French girl, who despite working crazy shifts at a health institution and being back from a small trip herself, let me crash on her couch, made me warm cereals and shared a beer with me. Couchsurfing restores your faith in humanity.